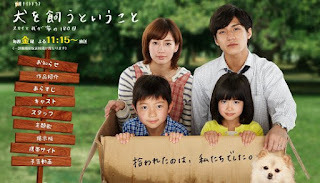 Cast: Nishikido Ryo, Mizukawa Asami, Kuge Kokoro and Yamasaki Ryutaro. This story is about the Hongo family: the father Hongo Yuuji (Nishikido Ryo), the mother Hongo Sachiko (Mizukawa Asami), the son Hongo Masaru (Yamasaki Ryutaro) and the narrator, the daughter and youngest Hongo Mako (Kuge Kokoro). Yuuji works as a salary man, and has a hard time, getting all the dirty work by requiring the resignations from factory workers - which mostly ends up with him kneeling, or the one people vent their anger on. Sachiko is a housewife, but also works part-time several places in order for the family to survive. Though poor, the family is scraping money in order to take a family trip, by saving pennies. This is one cute family drama! It has all the real-life issues that people have a hard time dealing with, and surprisingly very educational - not in the teaching aspect, but more of an inspirational characteristic… I honestly have a weird feeling that Nishikido Ryo has some secret family somewhere and he is preparing all his fans by making them watch all these family dramas, so that they won’t be shocked to see him with family. Besides that this drama has great actors, the kids even, which made it more enjoyable. The dog in this drama wasn’t the complete focus, yet part of the bigger picture.